Up above is my first decorating of the holiday season! I thought I'd start early so that I can do a little bit each week before Christmas. 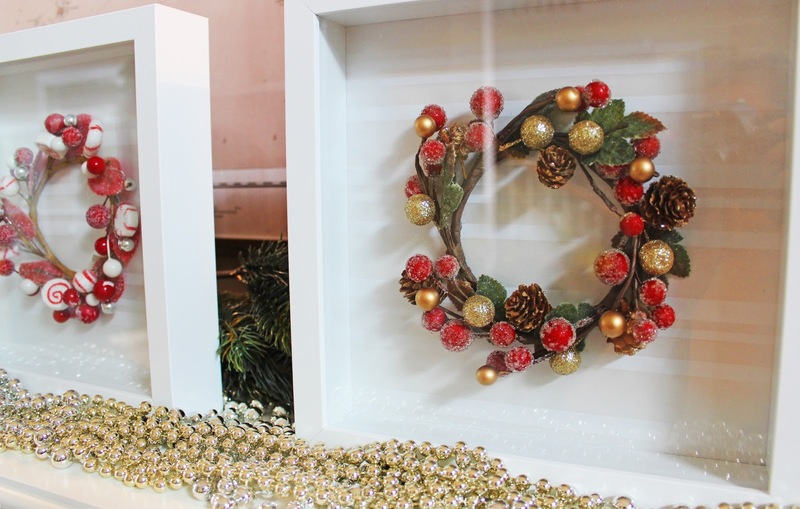 The star of this little display is my take on the traditional Christmas wreath; there's three of them, they're small, they're framed, and they couldn't be easier to make! 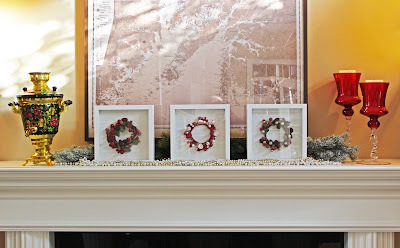 I was so charmed by these cute mini wreaths at the craft store, that I felt I needed to present them in a more special way than just hanging them on a door. I had a vision of them in shadow boxes, and I must say, the result is as special as I expected! I lined the frame backs with neutral striped wrapping paper to add some contrast and shine, and hot-glued the wreaths directly on the backs. 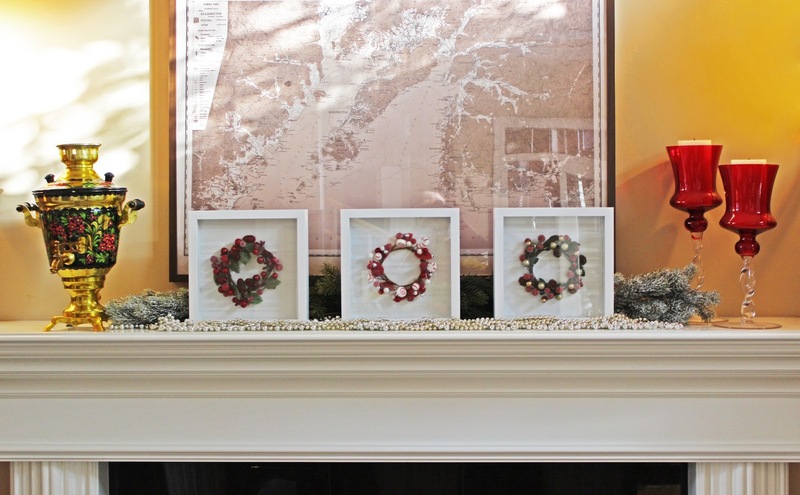 The wreaths really stand out against the white, and are perfectly festive. I love them standing on the mantel as opposed to hanging on a wall - they take up enough surface area to create a full mantel, but maintain a streamlined clutter-free look. The candle goblets and samovar reinforce the colours of the display, while the garland mimics the berries in the wreaths and adds a bit more festive glint! Posted by Unknown at 11:29 p.m. These are really beautiful. 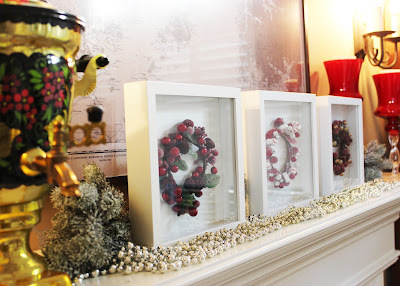 I love how they are framed. 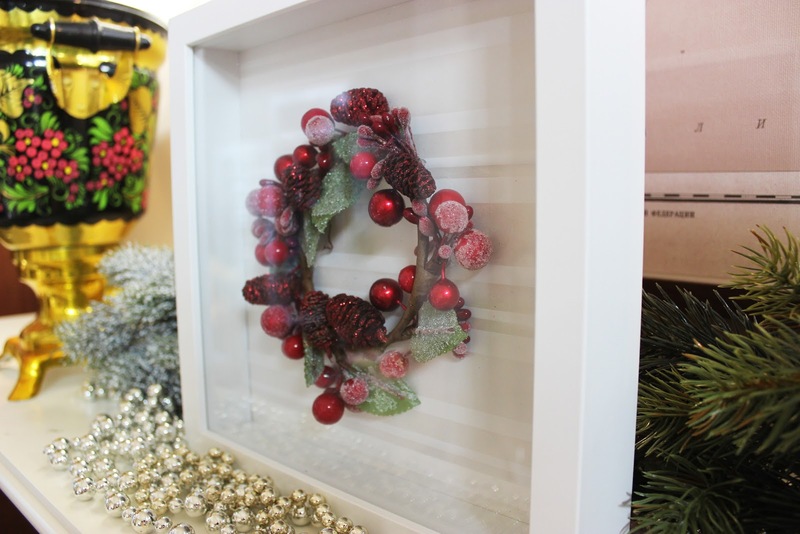 Thanks Linda, it was a really simple project - you can even try it with ornaments for a really unexpected display!